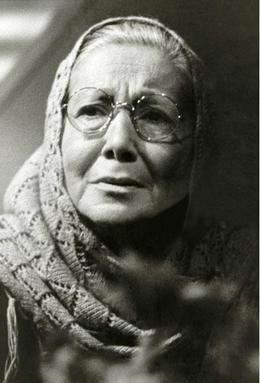 Jamileh Sheykhi (Persian: جمیله شیخی ‎‎, April 29, 1930 – May 23, 2001) was an actress and mother of actor Atila Pesyani. She made her stage debut in 1957 and began film acting with Shipwreck (1975, Nosrat Karimi). As a pioneer and veteran character actress of Iranian theatre and cinema, she performed in a number of films with reputable directors. Sheykhi has a distinguished screen appearance in Travellers (1991, Bahram Bayzai) and won Best Actress at the International Fajr Film Festival.